Pojo's Cardfight!! Vanguard news, tips, strategies and more! Check out our Message Boards where you can trade cards, discuss deck ideas, discuss upcoming tournaments and a whole lot more. 1 being the worst. 3 ... average. 5 is the highest rating. ...Garmore is very similar to Raging Form Dragon in his non-Limit Break effect, butwe'll get to that in a second. Garmore has a solid 11,000 Power, and his Limit Break is also pretty good in itself. You can Especial Counterblast 3 Liberators to, essentially, fill your entire field with the top 1-5 cards of your deck. This effect is a huge gamble seeing how you can either hit the perfect formation and win with a solid attack linewhile increasing the chances of hitting Triggers during the Drive Checks or fail miserably by having only Triggers show up, lowering your probability rate of pulling later Triggers and making a pretty weak attack formation. Personally, I already think that there's already a huge enough luck factor in the game with the Drive Checks, and seeing this card with its risky Limit Break and high payment cost makes it too risky to put the fate of the match on what you can call from the top of your deck. I know it sounds like I'm contradicting myself, but I'd rather be taking better chances with a natural game mechanic than an effect that'll probably explode in your face. Garmore also has an effect where when he attacks, you can put a Liberator unit from your rear-guard to the bottom of the deck to give Garmore an extra 4,000 Power when he attacks. This is definitely a nice effect as it's able to put Triggers that you have received from this Limit Break back to the deck along with a nice Power boost that can help in forcing out more Shield. Overall, Garmore isn't a bad card, but I'd rather risk the game with something more surefire like Alfred or Gancelot. ...and DON'T be a Sackboy!!! 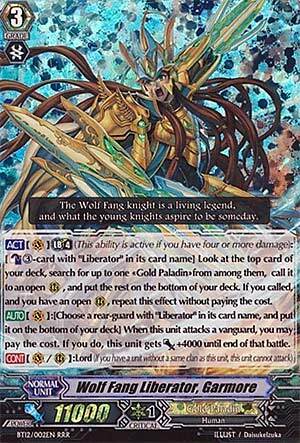 Next up among the crew that's left to fight the invading Link Joker, we have Wolf Fang Liberator, Garmore. A bit of a newb trap, in my mind. For a cost of Counterblast 3 Liberators, you call from the top of your deck until all your rear-guard circles are full. He can also put a unit to the bottom of the deck when he attacks to give himself 4k power. I think this is an excellent way to keep my reviewing skills sharp because of how you need to look at a card in context to get a realistic look at what he can do. His Limit Break sounds great because ERMAGUD PLUSSES. But if you realize the exact context in which he's used, you begin to understand he falls short in quite a lot of respects. Firstly, all of his plusses are totally random. So whatever you top is by no mean guaranteed to give you a good column. Secondly, the more you plus off this guy, the worse the situation you're in. If your field's empty or near empty by the time you use him (Late Game) it means you just got uber screwed in terms of hand and couldn't call for crap. At best, he's a desperate anti-retire counter. Also consider that the odds of actually making something of it is stacked against you. The average power of a unit in a deck is 7k, so a lot of the time one column will only shoot for 5k guard assuming you leave it. If you replace it, you've undermined his plus. Keep it, and you lose pressure and fall behind again. And yes, I am fully aware of the new stuff he comes with, Bruno, Geraint and what have you, but why would I want to go through all this effort and Vanilla-ise myself this much when I can achieve what this can achieve with Dantalian/Master of Fifth Element? As a rule of thumb, I don't recommend cards or even DECKS to people if I can name something similar that's more consistent, or just BETTER. His non-LB skill isn't really much better. I know it's meant to bolster his Limit Break, but it's just so lackluster. It's useless Mid Game because no-one guards the Vanguard at this point unless it's the End, or similar. And Garmore ain't that. So it's for Late Game, which is exactly when everyone will stock up their Perfect Guards to drop in his face. Which they would have done anyway because Critical Triggers really start to matter then. Yeah, how about I DON'T give up my consistent field for a crapshoot? Stick with Gance-Alfred if you must use the Liberators.